A figure emerges from the clouds of dust and dirt through a battle-worn field layered in pain and destruction, clad in articles seen worn by others much different. A vision of the Dark Soldier emerges from him and forms a new being, walking aside his master in unison. The two confront the three armored youths, and without hesitation, they begin to charge forward into battle. With his combined experience and mastery of the Keyblade and the dark arts, the elderly mage easily overwhelms the youths with one hand behind his back. 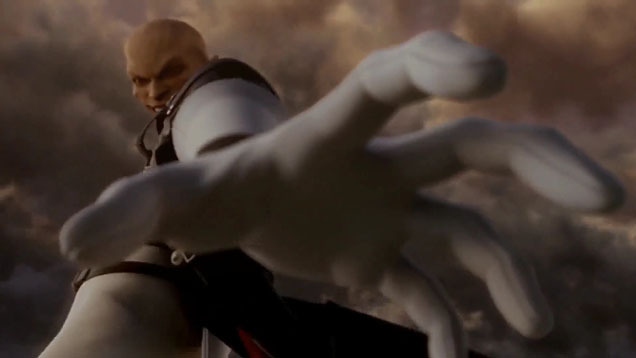 With the three of them now incapacitated, he gathers a fierce orb of pure dark energy in his hand and shoots it towards the sky, causing the clouds to part away and reveal the heart of all worlds: Kingdom Hearts.